The Netherlands Antilles (Dutch: Nederlandse Antillen), previously known as the Netherlands West Indies or Dutch Antilles/West Indies, are part of the Lesser Antilles and consist of two groups of islands in the Caribbean Sea that form an autonomous part of the Kingdom of the Netherlands (none of the other Antilles use this term in their name). The islands' economy is dependent mostly upon tourism and petroleum. Both the leeward ( Alonso de Ojeda, 1499) and windward (Christopher Columbus, 1493) island groups were discovered and initially settled by the Spanish. In the 17th century, the islands were conquered by the Dutch West India Company and were used as bases for slave trade. Only in 1863 was slavery abolished. In 1954, the islands were promoted from colony to a part of the Kingdom of the Netherlands as an associated state within a federacy. The island of Aruba was part of the Netherlands Antilles until 1986, when it was granted a "status apart", and became a separate part of the kingdom. If acknowledged by a referendum on all islands, from July 2007 onward, Curaçao and Sint Maarten will take a constitutional status similar to that of Aruba, while the smaller islands will be reincorporated into the Netherlands as Dutch municipalities. As a consequence, this means that as from the 1st of July 2007, the Netherlands Antilles will cease to exist as a state. The head of state is the ruling monarch of the Netherlands, who is represented in the Netherlands Antilles by a governor. The governor is also head of the local government, and forms, together with the council of ministers, the executive branch of the government. The legislative branch is two-layered. Delegates of the islands are represented in the government of the Netherlands Antilles, but each island has its own government that takes care of the daily tasks on the island. The Netherlands Antilles is to be disbanded on July 1, 2007. The idea of the Netherlands Antilles as a state never enjoyed full support of all islands. Political relations between islands were often strained. After a long struggle, Aruba seceded from the Netherlands Antilles to form its own state in 1986 (they are still associated with the Kingdom of the Netherlands). The desire for secession was also strong in Sint Maarten. In 2004 a commission of the governments of the Netherlands Antilles and the Netherlands reported on a future status for the Netherlands Antilles. The commission advised a revision of the Statute of the Kingdom of the Netherlands in order to dissolve the Netherlands Antilles. Two new associated states within the Kingdom of the Netherlands would be formed, Curaçao and Sint Maarten. Bonaire, Saba and Sint Eustatius will become directly part of the Netherlands as special municipalities (bijzondere gemeente), a form of "public body" (openbaar lichaam) as outlined in article 134 of the Dutch Constitution. These municipalities will resemble ordinary Dutch municipalities in most ways (they will have a mayor, aldermen and a municipal council for example), and will have to introduce most Dutch law. Residents of these three islands will also be able to vote in Dutch national and European elections. There are, however, some derogations for these island. Social security, for example, will not be on the same level as it is in the Netherlands and the islands are not obliged to introduce the euro and may retain the Antillean guilder pending further negotiations. All five of the island territories may also continue to access the Common Court of Justice of Aruba and the Netherlands Antilles (probably under a new name for the Joint Court). The three islands will also have to involve the Dutch Minister of Foreign Relations before they can make agreements with countries in the region. 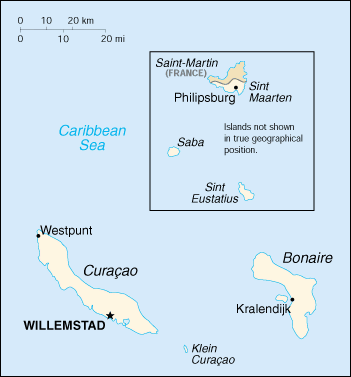 Originally the term used for Bonaire, Saba and St. Eustatius to describe their expected association with the Netherlands was "Kingdom Islands" (Koninkrijkseilanden). The Netherlands has proposed that the new EU constitution allows the Netherlands Antilles and Aruba to opt for the status of Outermost Region (OMR) also called Ultra Peripheral Region (UPR), if and when they wish. The Netherland Antilles have no major administrative divisions, although each island has its own local government. the "Windward Islands" (Bovenwindse Eilanden) east of Puerto Rico and the Virgin Islands. These are part of what are in English called the Leeward Islands, but in e.g. French, Spanish, German, Dutch and the English spoken locally these are considered part of the Windward Islands. Sint Maarten, the southern half of the island Saint Martin (the northern half, Saint-Martin, is French and part of the overseas department of Guadeloupe). The windward islands are all of volcanic origin and hilly, leaving little ground suitable for agriculture. The leeward islands have a mixed volcanic and coral origin. The highest point is Mount Scenery, 862 metres (2,828 ft), on Saba (also the highest point in all the Netherlands). Papiamentu is predominant on Curaçao and Bonaire (as well as the neighboring island of Aruba). This Romance creole descends from Portuguese with a strong Spanish admixture plus subsequent lexical contributions from Dutch and, latterly, English. Nevertheless, the official language of the islands is Dutch, and English on St Maarten, Saba and St Eustatius. Legislation is produced in Dutch but parliamentary debate is in Papiamentu or English, depending on the island. Due to the islands' closeness to South America, Spanish is becoming increasingly known and used throughout the archipelago. The majority of the population are followers of the Christian faith, mostly Roman Catholic. Curaçao also hosts a sizeable group of Jews, descendants of a Portuguese group of Sephardic Jews that arrived from Amsterdam and Brazil in 1654. Most Netherlands Antilleans are Dutch citizens and this status permits and encourages the young and university-educated to emigrate to the Netherlands. This exodus is considered to be to the islands' detriment as it creates a brain drain. On the other hand, immigrants from the Dominican Republic, Haiti, the Anglophone Caribbean and Colombia have increased their presence in the last years. The origins of the population and location of the islands give the Netherlands Antilles a mixed culture. The Wikipedia articles on the specific islands have more information on culture. Tourism and overwhelming media presence from the United States has increased the regional United States influence. On all the islands, the holiday of Carnival is, like in many Caribbean and Latin American countries, an important one.